the secondary panel on the bottom. The main window of GINsim, featuring an empty model. see the graph page or merge its content here? The File menu offers all the classical options to open/save a file, to open/close a window, and to quit the application. to create a new graph. This opens a new window unless the current graph is empty. to load a graph from a file. This opens a new window unless the current graph is empty. to open a recently used graph. This submenu lists the last opened graphs. to open a graph and merge it with the current one. This option works only for regulatory graphs. to close the current graph. If other windows are opened, it will simply close the current one, otherwise it will last with an empty window. to save the current graph. 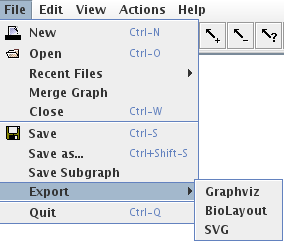 If the file is new orif the Save as option has been selected, a file selection dialog appears which allows to choose the graphical attributes to save: it is possible to save only the structure of the graph, ignoring all graphical attributes, or to save only the position of nodes. The default is to save all graphical attributes (position, size, color, shape...). The graph is saved in the (XML-based) GINML format. save the current selection as a new graph. The regulatory graph can additionally be exported into different formats. 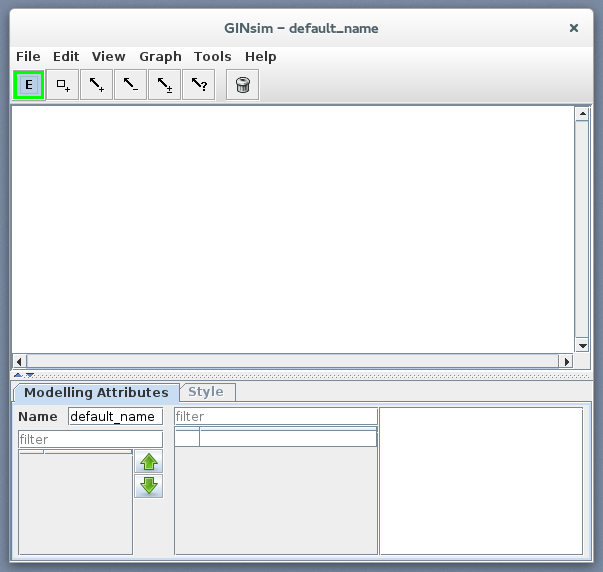 close all graphs and exit the GINsim application. Some of these actions (New, Open and Save) are also available from the toolbar. 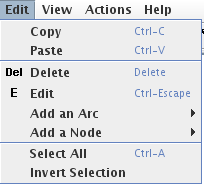 The Java Save dialog allows to browse and create folders, as well as to choose their location. By default, only folders and GINML files are shown; other files can be seen by removing the GINML Files filter. The drop-down list on the right side allows to select the graphical attributes to save. The	ExtendedSave checkbox allows to enable or disable extended save (which generates an archive containing the graph and related data). 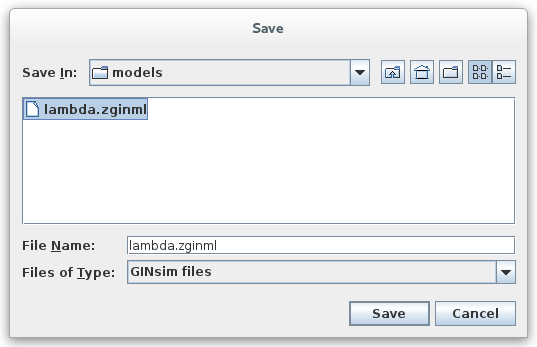 If the Extended Save option is selected, the file is saved in an archive (zip file with a .zginml extension) instead of a xml file (with a .ginml extension). This allows to save related data, such as simulation parameters or mutant definitions, along with the model. These files need GINsim 2.3 or later to be opened. The Edit menu allows the selection of some editing options. It is composed of three sections: copy/paste, graph editing tools and selection management. The edit menu offers classical Copy / Paste entries. Copy and Paste actions are specific to GINsim: copying the graph and pasting it into an external application is not supported. These actions are only available for regulatory graphs. Regulatory graph elements can be copied and pasted from one GINsim window to another. Pasted elements are automatically selected to ease their move. The Copy action does not test selected interactions, it will automatically select ALL interactions between selected genes. Logical parameters are also copied and cleaned up: logical parameters involving not-copied nodes are suppressed. The resulting graph is consistent but the new parameters may need to be checked. TODO: replace this all with a short note and point to the relevant index pages? The Action menu for a regulatory graph. The first tab (called Modelling Attributes for regulatory graphs) will change with the type of graph. Panels for the various graph types are described in the corresponding sections. The Graphical Attributes tab allows to edit the appareance of the selected items. It is described in the graph view page.